Springtime in Minnesota always reminds me of a baby bird coming out of it's shell. The entire landscape has a brown skin on it after coming out of the winter thaw and the green life inside has to break through the crust. It's a beautiful process to witness. We saw our favorite sign of spring the other day when an albino squirrel skittered through our backyard. We kind of think of them as our boys' guardian angels. 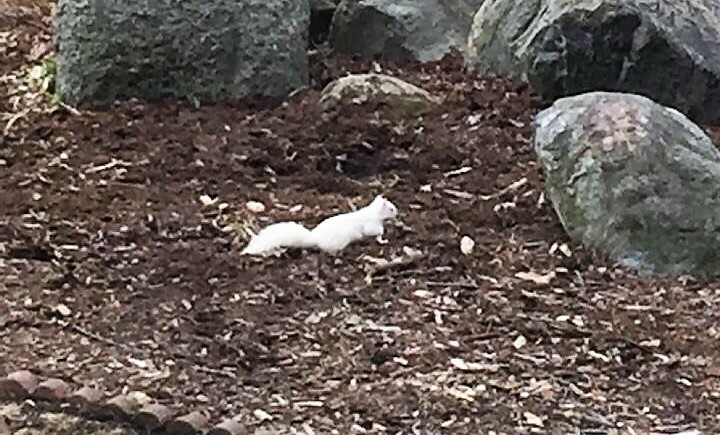 I had never seen an albino squirrel in my life before my boys were born and now we have seen them in our yard every summer since. At two different houses in two different cities even! On Friday night, we stopped by to see our good friends, Jen & Dan Walters, for our first bonfire of Spring. I kind of like the ominous dark of the fire looking like it's trying to grab us in this picture. In this photo, we were trying to capture the moon in the background but it looks awfully tiny. I kind of thought the smoke from the fire gave us a cool effect though. It was a little bit chilly outside, but the fire kept us nice and warm. Eventually we became bored with the fire so wandered out into the woods to see what we could find. When I spotted Dan's deer stand, I knew it was something I had to give a try. Sadly, it appeared to be defective, though. I sat up here for at least 10 minutes and didn't see a single deer. Bright and early Saturday morning, I took the dogs into the backyard and gave them their surprise of the day. I said the words "Dog Park!" As you can see, it stopped both of them in their tracks. Sunny turns 12 this month and is really starting to show signs of his age. He still loves going to the dog park, though, and gives it his all to keep up with the younger pups. Our two year old golden retriever, Blue, is probably the most passive dog in the whole place. We try to tell him he's a big dog, but he just doesn't get it. No matter how small the other dog is, he will go up to it, lay down, roll over to expose his belly and say something like "Please sir, have your way with me!" It's actually a little embarrassing. How can you not love the dog park when you get to see guys like this?